Next post: Finished the quilt top! It’s been an action-packed week, and I’m still recovering! My mom visited, and I helped her with some Photoshop stuff, and helped her set up her blog. We finished the center section of the quilt (more on that later). And we did “dueling restaurants” on Wednesday and Thursday last week, going to Manresa on Wednesday and The French Laundry on Thursday. A friend had told me that Manresa was better than The French Laundry, which I found hard to imagine, so we agreed that we would try both. The verdict? 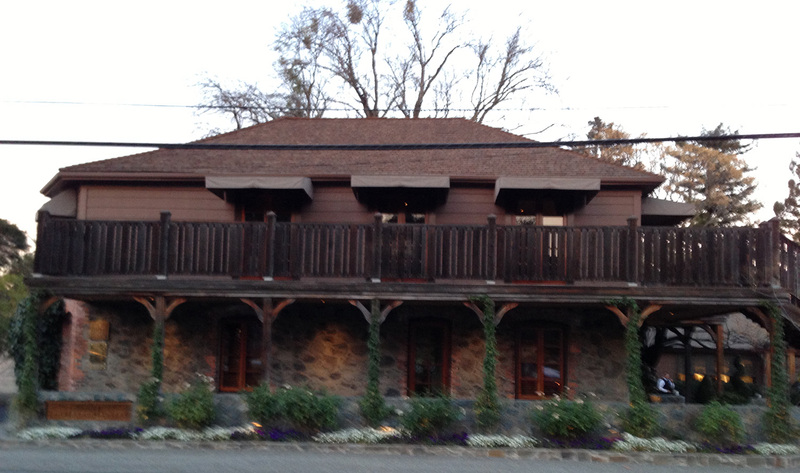 Both restaurants had excellent food, but The French Laundry, unsurprisingly, won hands down. 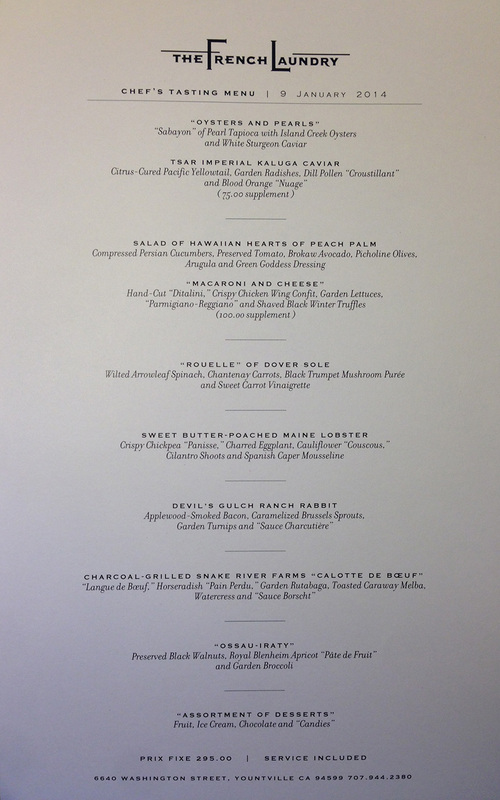 Manresa had a more imaginative menu with a more whimsical presentation – for example, the salad course came out on a plate with two hands printed on it, cupping the salad as if it were just torn from the earth. And it came complete with speckles of “dirt” (spices) on the side – very cool! They presented twelve imaginative courses, all of which were excellent, as you would expect from such a highly-rated restaurant. (Manresa has two very hard-to-get stars in the prestigious Michelin Guide.) However, some of the flavor combinations felt a trifle off-balance, and the service felt a little mechanical at times. The French Laundry, on the other hand, was much more traditional in its choices, but each course was perfect – not just in the blend of flavors and the presentation, but in the combination of textures. The first canape was a tiny tuile cornet filled with red onion creme fraiche and topped with a tiny bit of tuna tartare. It looked like a tiny three-inch ice cream cone, and was just perfect – the sweet crunchiness of the tuile, the savory, creamy richness of the creme fraiche, and the meltingly-tender tuna blended together marvelously. And the last course, the mignardises, included some chocolate covered macadamia nuts that were just to die for. Regular chocolate covered macadamia nuts are pretty good too, but the pastry chef had coated the macadamia nuts in a very thin layer of salted caramel before dipping them in chocolate, adding a layer of sweet, bitter, slightly salty crispiness. The result? A really amazing confection, which I hope to imitate (probably not as well, however) in this year’s chocolatiering. The food in between was also marvelous, of course, with artistic plating and wonderful juxtapositions of flavors and textures. The first course, “Oysters and Pearls”, was a sabayon of pearl tapioca with oysters and caviar – the saltiness of the caviar perfectly set off the smooth richness of the tapioca sabayon, and the tapioca provided a subtle textural echo of the caviar. The oysters were tiny, delicate, and perfect. Paradise for a foodie. My mom loved it – which was, of course, why I’d suggested it! We had a wonderful time, and they even sent us home with some extra chocolates and a small tin of lavender cookies. A fantastic evening. 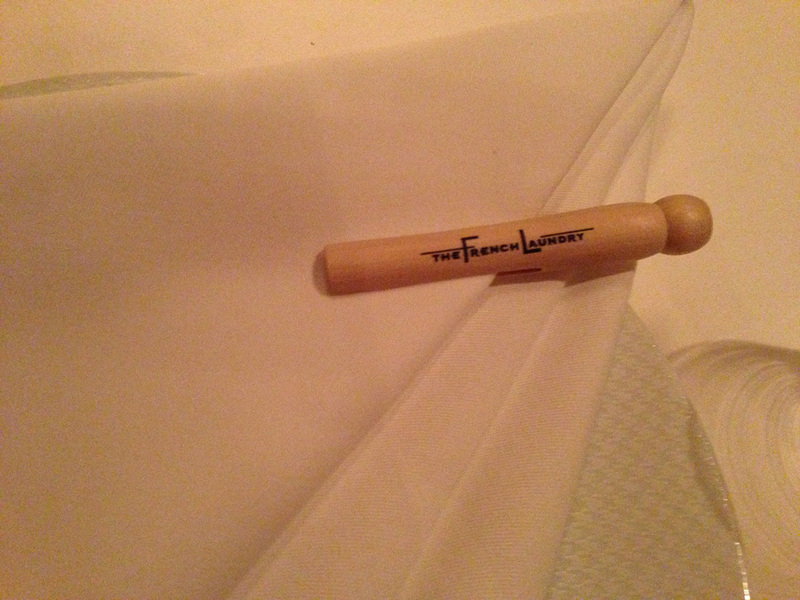 Napkins at The French Laundry come with a free clothespin! 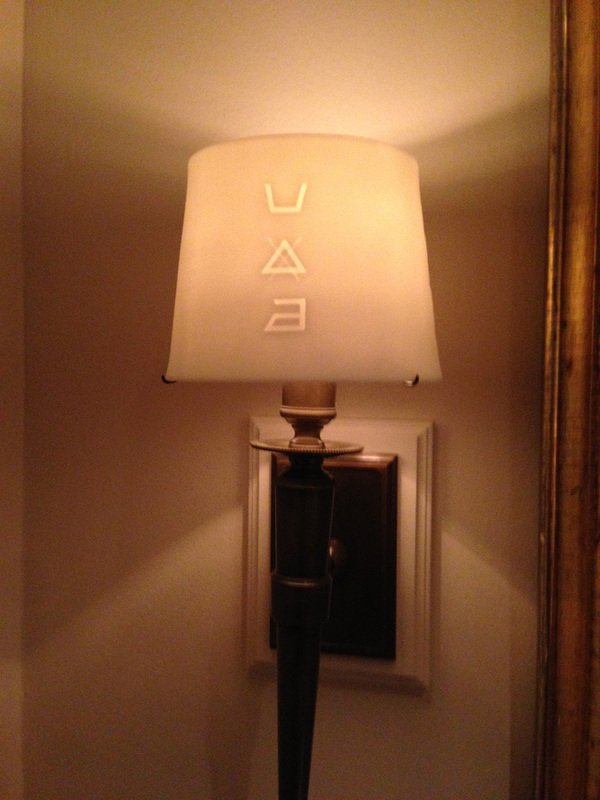 Lampshade at The French Laundry, sporting international care symbols for laundry! I so enjoy seeing you wear your lovely, handwoven clothing….as well as following you in your many adventures! Great picture of you and your mom. As someone who looks exactly like her mother (and more so every day) I can really relate to this pic. Some days I love looking like my mom and other days it makes me squirm. 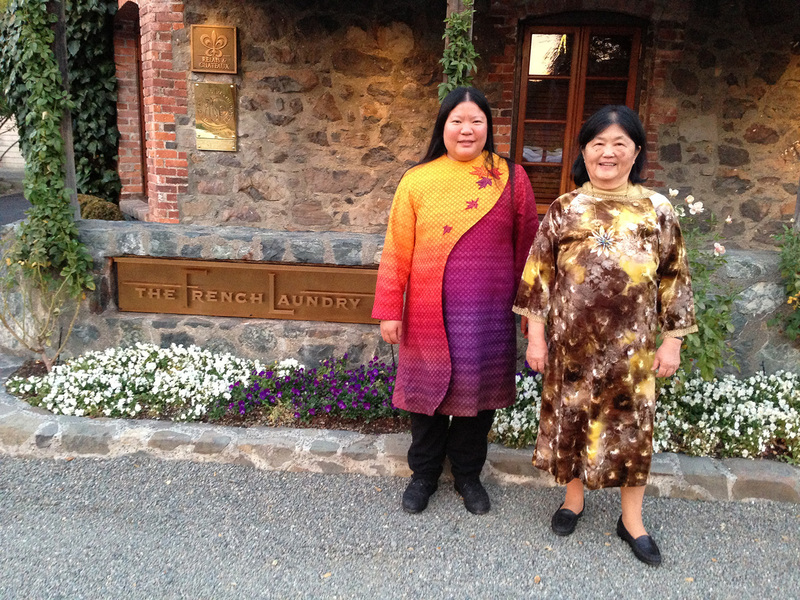 Tien, you look smashing in your lovely handwoven coat. What a happy Mother daughter picture! The food you describe sounds so delightful, almost makes me want to visit California….